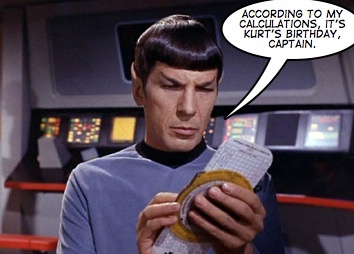 That's right Mr. Spock, it is! In a little less than an hour and a half, I'm going to get a phone call from my mother at about 2:59 p.m. (EST), reminding me of the time I was born. I love it when she calls. And as usual, I got an early morning phone call from my Dad wishing me a happy birthday too, but he forgot I was at work when he called. Still, it's such a great blessing that he's reminded of today, as I am of the wonderful parents God has blessed me with. Each year my Dad does something different for my birthday, which I have no doubt that he does the same for my brother, when he somehow encapsulates the number of years of our lives in a very unique message. Like this one he sent to my cell phone one year that said, "Rise and shine, you're 39! HBD!" Tonight, we're going to one of my favorite Italian restaurants for dinner and I'm going to enjoy some really good lasagna and then back home for desert to have my favorite style birthday cake - double layered yellow cake with chocolate frosting. It is definitely YUMMO, especially with a nice tall glass of milk. So, thanks for reading this post today. I'll be getting back to writing more frequently over the summer, so stay tuned. God bless you all and have a wonderful day today. I'm incredibly thankful and blessed for the life God has given me all these years so far. Thanks Joe! I'm looking forward to reading the books too.